The parking karma still works because; we found a parking spot half a block away from the ‘Beaver Creek Smokehouse’ in Martinez, California. Once we exited the vehicle a beautiful intoxicating smoke aroma that I know so well greeted our bbq sensors. We walked to our destination to take our place in line with the customers already waiting for the 11:30am opening. The opening bell sounded and it was time to have some great competition worthy barbeque. 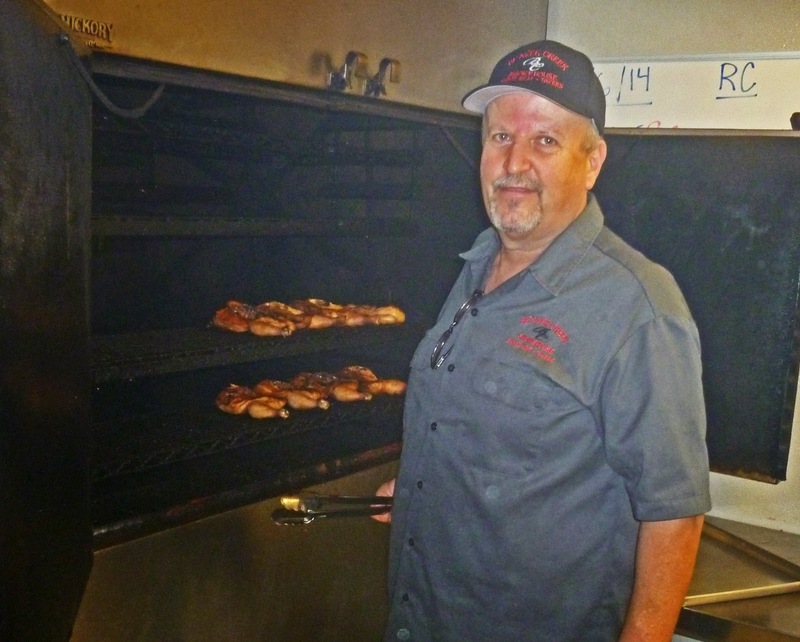 Beaver Creek Smokehouse is operated and owned by Rob Z (Zavatero). We know him from bbq competitions. He is a champion and darn tootin nice guy. Beaver Creek Smokehouse has only been open for six months and I am kicking myself for not coming sooner. Rob makes everything from scratch. He uses the best meats available in our area such as; Niman Ranch, Homestead Natural, Certified Angus Beef and Mary’s air chilled chicken. All the sides and sauces are made from scratch. I want to try everything. They do have a “5 way” sampler that will fill this bill for now. This was one pretty platter of meat. I devoured every single morsel on that tray. The smoke was perfect. The tenderness was excellent. The chicken was so juicy it gave me a squirt of love when I bit into it. At each table three different house made sauces are available. I enjoyed my meal so much; I did not even try the sauces. (A first). It is rare to have all meats done to such competition worthy perfection. The Cole slaw was bright and fresh with a vinegar tang. The beans were studded with brisket. This was more than just beans; it was like an award winning chili. Rob offers local micro-beers for your pleasure. There is a nice beer garden in back that will be a summer destination. Why? 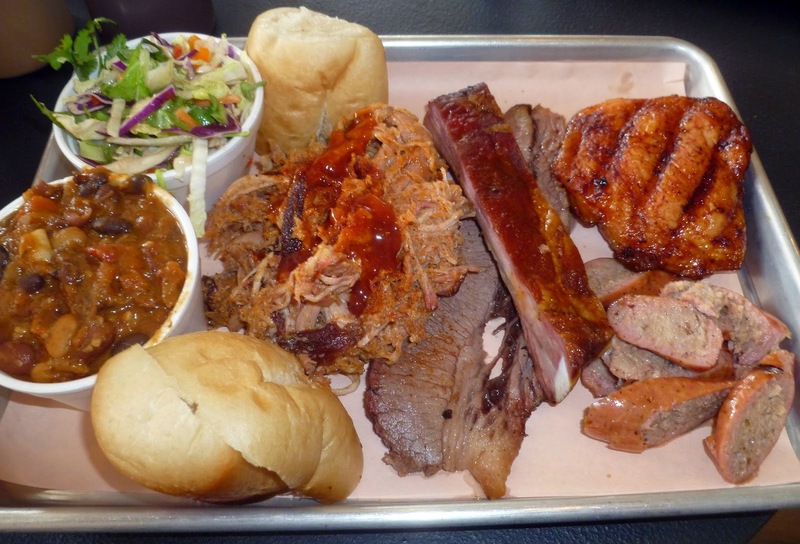 Why did I wait so long to try Beaver Creek Smokehouse? We shall return. I definitely want some more of that brisket. The beans were the first thing that caught my eye and I'm glad that they were as good as they looked. Now I'm craving brisket. Chris, I would go back just for the chili. How is your book coming along? I know you have been busy and we are looking forward to it. Very high praise Chilebrown. This establishment will have to be added to our next Bay Area journey. Oh yeah, when the parking karma goes bad, it will in a bad way would be my guess. Okay, I might not even wait to be called for jury duty! I'm going soon! Once again I have looked at your blog before breakfast and so fungry! Got to have some!! Where is Martinez? Can you see Russia from there? I wanna go. Da, da. Three Dogs BBQ, This parking roll will last as long as I have positive thoughts. I hope. Zoomie, When you go do not put money in the meter so you can come back to pay your ticket. Maybe that is not a good idea. Just go, you will enjoy. Greg, You will have to wait till 1130 opening time. You may have to wait in line. Cookiecrumb, I would tell you where but I know you will not leave the Marin zip code area. Asparagus!!!!!!!!!!!!!!!!!! Looks like a great place and now I'm hungry. Big Dude, I seem to be hungry all the time especially for bbq.